Water surrounds us in New Orleans. Flooding is a reality we face living here in southeast Louisiana. Recently the National Flood Insurance Program (NFIP) has been in the news for several reasons. Second, and more than likely where you may be noticing NFIP in the news, is that FEMA has been busy changing flood zone maps to reflect updated flood risks. Orleans parish went through the re-mapping process last year and now it’s Jefferson Parish’s turn. If you are in a “Prefered Flood Zone,” also referred to an “X” or “B” zone, whether you are in Orleans or Jefferson Parish, DO NOT CANCEL your flood insurance even though your mortgage company may not require you own flood insurance. Jefferson Parish’s newly re-mapped flood zones are now impacting your flood insurance policies. If your home was previously located in a standard flood zone and is now moving to a preferred flood zone (Zone X), congratulations! You’ll be saving some premium dollars. New Orleans and Jefferson Parish are surrounded by water. New Orleans is shaped like a bowl. Water collects in the city and has nowhere to go because we are built on a swamp. There’s a reason we bury our dead above ground. We are vulnerable to flooding. Our coast is drowning. We live in hurricane alley. It’s not just wind that impacts us but the water being pushed in from Lake Pontchartrain and other surrounding bodies of water. Not much really needs to be said on this topic except remember Hurricane Katrina. How about more recently, Hurricane Harvey in Houston where the majority of the people were not required to carry flood insurance by their mortgage company. I was in Houston recently and my Uber driver was one of those people who had to pay flood damages, out of pocket, because he did not own flood insurance by recommendation of his mortgage company. We all know someone like that in town. We don’t need a hurricane to experience quasi-Biblical flooding in New Orleans. Remember the August 5th, 2017 floods? We had 8 – 10 inches of rain in 3 or 4 hours and half the city was flooded. Remember the Louisiana flood of 2016 in the Baton Rouge area where the majority of people impacted did not have flood insurance since they weren’t required to. There are countless flood events that could, and should, serve as compelling reason enough not cancel your flood insurance. And, if my memory serves me well, many other flooding events have happened in May, so you still have time to buy flood insurance if you do not currently own it (there is a 30 day waiting period). Get started here. 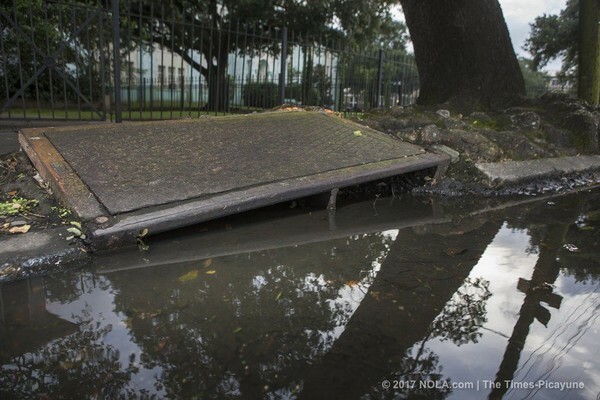 The rain and hurricane events are exasperated when the city’s flood control systems fail. I’m not casting blame here on who’s responsible: Sewerage and Water Board, the New Orleans City Council, or the Mayor, but it is our reality that a dysfunctional government cannot solve one of the basic responsibilities it has: to protect people and property. Are the pumps working in your neighborhood? I know some of those issues are New Orleans specific, but we can easily talk about Jefferson Parish pumps not being switched on. That’s right, 46 tons of Mardi Gras beads were found in the catch basins between September 26, 2017 and January 23, 2018. That doesn’t include leaves, mud, and sludge that were were sucked out by cleaning crews. And to think that only one-forth of the cities catch basins were flushed. That leaves about 53,000 more to go…maybe the ones in your neighborhood. If you live in New Orleans or Jefferson Parish, buy flood insurance. If you’re in Jefferson Parish and you now find yourself in a preferred flood zone like many New Orleans residents did last year, don’t cancel the new policy. But be warned, if your mortgage company has paid your insurance premium through your escrow account, you are now going to be responsible to pay it yourself. Hopefully you never have to test your flood policy. But the reality of our environment is that it may be one of the most likely policies that will pay out a claim in your lifetime. If your one of those who has been in a preferred zone and are now compelled to get a quote, let’s get started today. Remember there is a 30 day waiting period. Don’t wait until it’s too late.